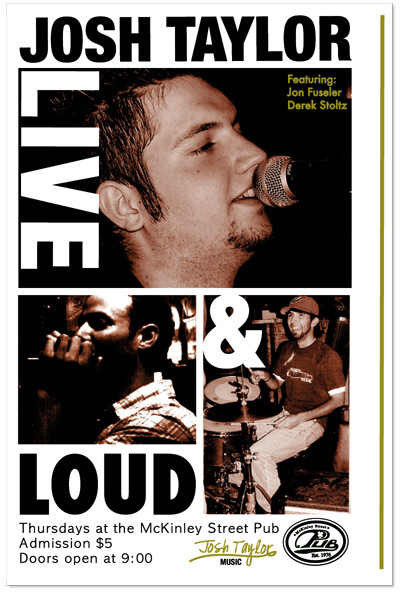 Objectives: To create a series of graphics that can be used as promotional ads for various live performances. Details: Taylor needed graphic artwork that would reflect his mainstream, radio-friendly style. To reflect Taylor’s style-characteristics, treated photography combined with handwritten and simple sanserif display fonts were selected as the consistent elements throughout the series of graphics. The above graphic was used as an 11×17 poster. Objectives: To create an identity for a popular, local singer/songwriter. 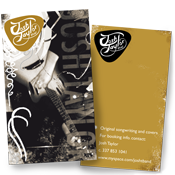 Details: Josh Taylor Band, known for their spin on popular covers and original pop/rock songs needed a logo and business cards that would reflect their mainstream, radio-friendly style. The logo was designed to appear as a guitar pick with a modified version of Taylor’s signature on it. The font face, drawn from scratch, is a hybrid grouping of calligraphy elements and handwritten serif fonts. The business cards were constructed by combining distressing techniques, photographic elements, and typography.